Pricing for your pets grooming is based on the amount of time and product needed to achieve the beautiful coat you want. Each pet is unique, even within the same breed. For example, we are often asked, How much do you charge for a Golden Retriever? One flat price cannot be set for any breed. Coat type, size of the dog, living environment, home care, and frequency of professional grooming simply create too many variables. Lets say for the sake of this conversation, though, that we have two dogs that are identical in size and coat type, but one lives indoors and one lives outdoors. Its not practical to think that we can wash them the same way and get good results. Having said that, we can give a firm price for any pet once we see them and evaluate all the elements listed above to determine the amount of time and product necessary to get the professional results you expect. Every client at Tailored Tails receives a firm price for their approval before any grooming begins. Rest assured that our pricing for all pets is competitive for this area. Its our job to know. 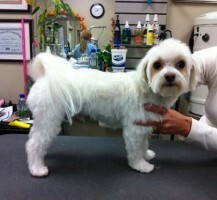 First, we employ only professionally-trained or Certified Groomers. Did you know that grooming is not a regulated industry and not all Groomers are Certified? There is no such thing as licensing for Groomers! Second, we have a comprehensive Safety Program in place that includes too many details to list. 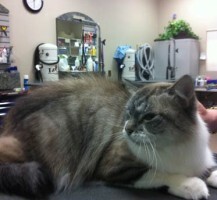 We also check for current vaccinations on all pets entering our Salon for the safety of everyone. Current vaccinations are required by state law, county regulation, OSHA requirement, and insurance regulation. Would you really risk taking your pet to any facility that does not check? If any facility is not checking vaccinations, I would have to wonder what else they might be overlooking a scary thought at best! Thirdly, we include several things that other salons do not, such as custom-selected shampoos for each coat type, conditioner is always included, and nail filing is always included as well. Other salons charge additional for these professional details, but here at Tailored Tails we believe every pet deserves the best without having to nickel & dime our clients for each item! *Often an extra fee at other salons, but not with us! Your pet deserves the best! All products used are custom-selected based on coat type & condition. We use only the best high-quality products for excellent results and many of our products are all natural or organic.